Anyone whose ever flown or driven across country through time zones has experienced a form of time travel. Sort of. It might not be a different epoch or a different plane of existence but our bodies and minds are put in a position to experience our surroundings differently. We are adjusted to whichever time zone we spend most of our days existing in, so when we leave that zone it feels like an altered reality. Especially if you travel far enough to jump calendar days. Recently I traveled to Chicago from my hometown Los Angeles (in fact, I’m on the plane now) and came across an interesting series of articles in the airline magazine. You know the one that sits in front of the safety card in the back-of-the-seat pocket. In this case it was Southwest-The Magazine. The article I was interested in was entitled “Perfect Timing” by JK Nickell. It featured a piece about the resurgence of swiss movement stating that the “demand for expert watchmakers returned”. It was “the higher-ups at the thriving young Swatch brand [who] decided to use their success to revive the mechanical industry. Prompting a resurgence of Swiss watches”. Reading this piece made me think of man’s evolution in the necessity of time-telling, which is essentially a way to measure our lives. The more we need to coordinate with each other the more we need precise forms of measurement. Therefore, this resurgence of swiss movement seems to be a mere delicacy. A frivolous yet expensive luxury. But is it? The absence of various exposures of time-telling is both an indicator of how we experience life, as it is also a dictator of such. Time has a sense of concealment these days. Of being invisible. There are no visible gears, no audible sounds, no winding necessary. We glance at our respective computers, whether it be our smart phones, tablets, laptops or desktops for the time of day. All perfectly synchronized. All perfectly silent. All perfectly…invisible. No child will ask themselves ‘how does this timepiece work’, inspired by its visible moving gears, and try to take it apart. Time has become dissociated and lifeless. Although, to call it lifeless is ironic since this easy and precise way of telling time comes from the invention of the atomic clock. The atom is at the core of each living thing and is now at the core of each atomic clock. Subatomic particles called electrons, when exposed to certain frequencies of radiation, or radio waves, “will jump back and forth between energy states” and the atomic clock measures the exact vibration of an energized atom (livescience.com). So is the atomic clock the truest telling of time? If there are no atoms, does time cease to exist? What is time exactly? “Bound up in this question is an investigation that gets to the core of our humanity: Where did we come from? Where are we going? And really: Who are we?” (“Perfect Timing”, Southwest The Magazine). How does time relate to each of us and how does it relate to the vastness of eternity or infinity? In short, can time telling really be applied to the whole universe. Action and inertia become one in the same. Both resulting in motion; either reactively or perpetually. Time is defined by existence. i.e relativity. As Action & Inertia manifest, they create constants in the universe. Suggesting the notion of infinitum, an unmeasurable quantity of time that does not exist linerally but in all directions simultanelously. Thus making Existence cyclical, if time is measured relative to space & matter. 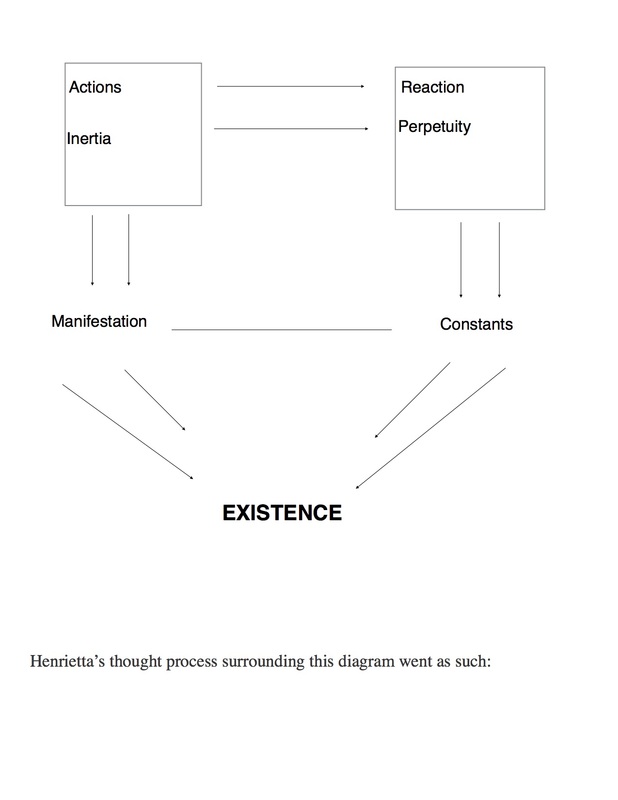 If existence is cyclical then a “beginning” never occurred. It simply has always been. 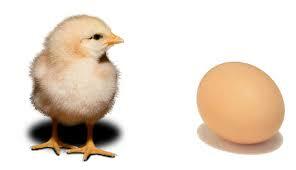 We are left with a sort of chicken and egg question. If we refer to Hoyle’s theory on collective consciousness he states, “All times exist with equal reality” (About Time by Paul Davies). He goes on to consider that “by extension, all conscious beings in the universe, human, animal and alien, could actually be the same consciousness, but activated in different contexts at different times”. In other words, the answer to the chicken and egg question is: neither. They existed simultaneoulsy. If time exists in all directions at infinitum, then one did not come before the other, the egg and chicken existed together. Lewis Carroll also explores this idea of a single or connected consciousness in Through the Looking Glass, “ ‘So I wasn’t dreaming, after all,’ she said to herself, ‘unless—unless we’re all part of the same dream’ ”. This idea of existing as one being would suggest that we all exist all the time. Whether this helps define the formerly proposed questions of : Where did we come from? Where are we going? And who are we? It at least connects us. Though we might all be consciously connected, I’d have to agree with Alice. I’d prefer to be the one doing the dreaming. With or without an egg…or a chicken, for that matter.